What Is a Battery Backup? Do you need a UPS? How much will a battery backup protect your computer? A battery backup, or uninterruptible power supply (UPS), is primarily used to provide a backup power source to important desktop computer hardware components. In most cases, those pieces of hardware include the main computer housing and the monitor, but other devices can be plugged into a UPS for backup power as well, depending on the size of the UPS. In addition to acting as a backup when the power goes out, most battery backup devices also act as power "conditioners" by ensuring that the electricity flowing to your computer and accessories is free from drops or surges. If a computer is not receiving a consistent flow of electricity, damage can and often does occur. While a UPS system is not a required piece of a complete computer system, including one as part of yours is always recommended. The need for a reliable supply of electricity is often overlooked and not fully realized until damage has occured. Once you've chosen the right one for you, you can buy a battery backup from popular manufacturers like APC, Belkin, CyberPower, and Tripp Lite, among many others. Battery backup goes by many names. Uninterruptible power supply, uninterruptible power source, on-line UPS, standby UPS, and UPS are the different ways to refer to a battery backup. The battery backup sits between the utility power (power from the wall outlet) and the parts of the computer. In other words, the computer and accessories plug into the battery backup and the battery backup plugs into the wall. UPS devices come in many shapes and sizes but are most commonly rectangular and freestanding, intended to sit on the floor near the computer. All battery backups are very heavy due to the batteries located inside. One or more batteries inside the UPS provide power to the devices plugged into it when power from the wall outlet is no longer available. The batteries are rechargeable and often replaceable, providing a long-term solution to keeping your computer system running. The front of the battery backup will usually have a power switch to turn the device on and off and will also sometimes have one or more additional buttons that perform various functions. Higher-end battery backup units will also often feature LCD screens that show information about how charged the batteries are, how much power is being used right now, how many minutes of power are left should power be lost, etc. The rear of the UPS will feature one or more outlets that provide battery backup. In addition, many battery backup devices will also feature surge protection on additional outlets and sometimes even protection for network connections, as well as phone and cable lines. Battery backup devices are manufactured with varying degrees of backup ability. To determine how powerful of a UPS you need, first, use the eXtreme Power Supply Calculator to calculate your computer's wattage requirements. Take this number and add it to the wattage requirements for other devices you would plug into the battery backup. Take this totaled number and check with the UPS manufacturer to find your estimated battery runtime when you lose power from the wall. There are two different types of UPSs: A standby UPS is a type of battery backup that's similar to an on-line uninterrupted power supply but doesn't go into action as quickly. The way a standby UPS works is by monitoring the power that's coming into the battery backup supply and not switching over to the battery until it detects a problem (which can take up to 10-12 milliseconds). An on-line UPS, on the other hand, is always providing power to the computer, which means whether a problem is detected or not, the battery is always the computer's source of power. You can think of an on-line UPS as if it were a battery in a laptop. While a laptop is plugged into a wall outlet, it's getting constant power through the battery which is getting a constant supply of power through the wall. If the wall power is removed (like during a power outage or when you unplug the power cable), the laptop is able to remain powered on because of the built-in battery. 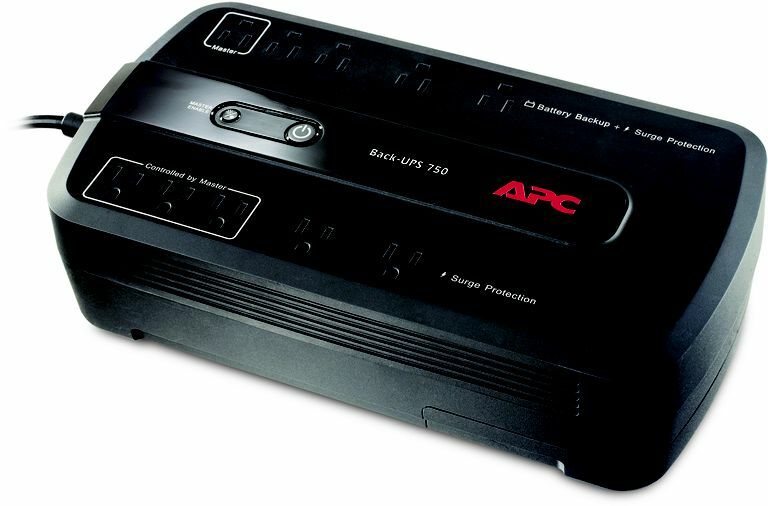 The most obvious real-world difference between the two types of battery backup systems is that, given the battery has enough power, a computer won't shut down from a power outage if it's plugged into an on-line UPS, but it might lose power (even if just for a few seconds) if it's attached to a standby UPS that didn't respond to the outage quick enough... although newer systems can detect a power issue as soon as 2 ms. Given the benefit just described, an on-line UPS is normally more expensive than a standby UPS or line-interactive UPS. Line-interactive UPSs are very similar to standby UPSs but are better designed for areas that have frequent voltage drops; they cost a bit more than a standby unit but not as much as an on-line UPS. Some battery backup systems you find may seem pointless because they only supply a few minutes of power. However, something to consider is that with even 5 minutes of extra power, you can safely save any open files and shut off the computer to prevent hardware or software damage. Something else to remember is how frustrating it is for your computer to immediately shut off when the power turns off for even a few seconds. With the computer attached to an on-line UPS, such an event may even go unnoticed because the battery will have been providing the power before, during, and after the power break. If your laptop has ever gone to sleep or shut down on you after you've stopped using it for awhile, but only when it's not plugged in, you're familiar with the fact that battery-powered devices can behave differently than desktops. This is due to built-in power options in the operating system. You can set up something similar on a desktop computer that uses a UPS (if the UPS is able to connect via USB) so that the computer will go into hibernation mode or safely shut off if so-many minutes has passed without power after the outage. This ensures that the UPS doesn't run out of juice and ultimately shut down the system abruptly. Why Is the Wattage Rating on My PC Power Supply Important?